"Devices obtained using these transfer techniques are usually unstable and vary from sample to sample," says lead researcher and former visiting student of Associate Professor, Jr-Hau He, Meng-Lin Tsai, who adds that transfer-related contaminants significantly affect device reliability. Electronic properties have also proven difficult to control by vertical stacking. 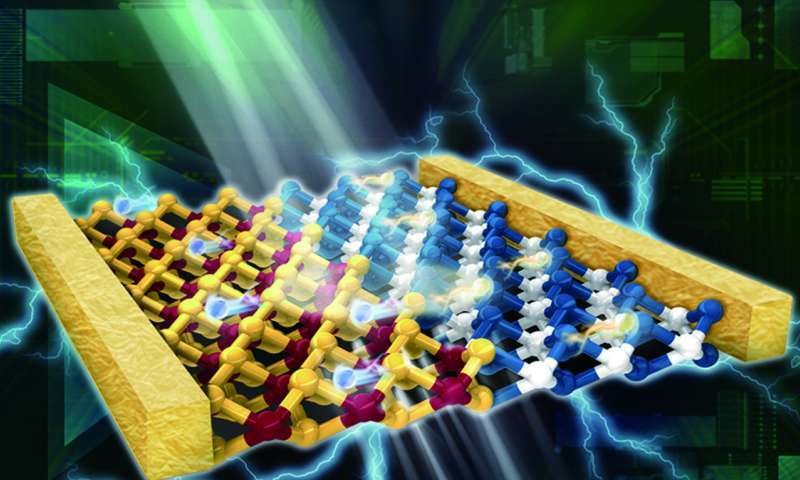 To fully harness the exceptional properties of these two-dimensional materials, Tsai's team, under the mentorship of He, created monolayers featuring lateral WSe2-MoS2 heterojunctions and incorporated them into solar cells. Under simulated sunlight, the cells achieved greater power conversion efficiency than their vertically stacked equivalents. These interfacial characteristics signaled success. "Our structures are cleaner and more ideal than vertically stacked assemblies because we didn't need the multi-step transfer procedure," explains Tsai. According to Tsai, the implementation of lateral heterojunctions in more complex circuits and interconnects may result in higher performance than in conventional solar cells and so the team is working on the next steps. "We are trying to understand the underlying kinetics and thermodynamics of these heterojunctions to design more efficient cells," he adds.